Listed below are events sponsored by the Sappington-Concord Society for the year 2013. Upcoming events are listed at the top of the page in chronological order. Events that have already been held are listed in the section sub-titled Past Events – 2013. The SCHS works hard to put on the events and programs it offers to its membership and the general public. It is hoped the events are memorable for those who attended them. It is also hoped that the listing of past events gives an idea of what kind of events can be expected in the future. To see the events held in 2012, go to Events – 2012. To see the events held in 2014, go to Events – 2014. Te see events coming up in 2015, go to Events – 2015. November 1-30, 2013, every day, all month long – Note, this event is over, held in 2013. Display by SCHS member Donna Wagner. She can gave a preview of her collection at the October general meeting. But for sure she is scheduled to have her items on view in the Tesson Ferry Library display case. That will be for the whole month of November. As you visit the library, be sure sure to “check out” some of their collection of local history items, some of which are usually on display on a rack near the check out counter. Be sure to stop to say hello to library manager and SCHS member, Anne Arthur, who spoke to us about library services at the April general meeting. Thank you, Anne! This event is featured on its own page which includes further information about the presentation, the speaker and includes links to other websites related to the topic. See The Changing Forms of Polite Behavior page. SCHS at Friendship Village – Thursday, November 7, 2013, 7:00 pm – Note, this event is over, held in 2013. On November 7, again a Thursday at 7:00 pm, at Friendship Village Sunset Hills, Ray Hoffstetter will give his talk “A Funny Thing Happened on the Way to Retirement.” Though it may not be directly related to history, Ray gives a fine talk and he was a long time cameraman for Channel 5. He also is a long time member of the Civil War Roundtable and gives talks on the Civil War. Come on out to meet Ray and hear him speak! See video of Ray Hoffstetter as archivist at Channel 5, digitizing news footage. Wednesday, October 30, 2013, 10:00 am – Note, this event is over, held in 2013. Wednesday, October 23, 2013, 7:00 pm – Note, this event is over, held in 2013. Looking down the road a bit, so to speak, our October general meeting will be on the topic of Historic Route 66 in St. Louis. Kip Welburn will speak to us. Held at Lindbergh High School in the Anne Morrow Lindbergh Room at 7:00 pm, finishing at 9:00 pm. Wednesday, September 18, 2013 Note, this event is over, held in 2013. On September 18th, I hope you all can bring one or two of your treasures to share for the Treasures Show and Tell event. Many people enjoyed this event last year and we had requests to do it again. At this very informal event, members brought items to show by putting them on tables for all to see. As members browsed around they had a chance to see what other members had brought, talk about them and learn more about each other. We even had a mystery item or two which everyone had a chance trying to explain or figure out. It was a fun and relaxed evening and we look forward to doing it again. It is Wednesday, September 18th at 7:00 pm in the Anne Morrow Lindbergh Room. Please come and bring a treasure or two. It is a good chance to invite someone new to the SCHS also! Thursday, September 5, 2013 Note, this event is over, held in 2013. SCHS is extending a friendly hand to the residents there for SCHS presentations and Friendship Village welcomes us to its friendly and comfortable venue. Thursday, September 7 at 7:00 in the Grand Ballroom, Abbi Telander will be giving her popular presentation on “Grant, the Family Man.” If you heard it once, this is your chance to hear it again, and if you missed it the first time, now you get a second chance to hear it and it is well worth hearing. General Meeting – Note, this event is over, held in 2013. General membership meeting; Lindbergh High School, Anne Morrow Lindbergh Room. Marge Jardon will speak on the explorations by Lewis and Clark. On Oct. 2 we will visit the Lewis and Clark museum in Hartford, IL and see Historic Alton. Get on board with this refresher! July 31, 2013, Wednesday, 10:00 am Note, this event is over, held in 2013. SCHS at Friendship Village – Note, this event is over, held in 2013. SCHS “Story Shorts” – Note, this event is over, held in 2013. Topic: The famous short story “An Occurrence at Owl Creek Bridge” by Ambrose Bierce. This relates to the topic of our April 24, “Civil War Espionage” by Marc Kollbaum. We will share insights and reactions to the story. The event will be held twice as listed below, so if you can’t make it the first date, you get a second chance. SCHS at Friendship Village – SCHS “Story Shorts” – Note, this event is over, held in 2013. Bussen Quarry Tour – Note, this event is over, held in 2013. Vietnam Traveling Wall comes to St. Louis – Note, this event is over, held in 2013. Memorial Day Ceremony – Note, this event is over, held in 2013. It will soon be time once again for our biggest and most solemn event of the calendar year, our Memorial Day ceremony. Last year we had good weather and our Memorial Day ceremony chairman, Bill Lowry, has ordered good weather for the program again for this year. We had a great turnout last year for the reception after the ceremony. Many ceremony attendees went up the hill to St. Lucas UCC for the reception with refreshments, air conditioning and lots of fun being gathered together. The ceremony will include patriotic and stirring vocal numbers as well as band music provided by the Lindbergh Spirit of St. Louis Marching Band. There will be buglers for taps and a number of other features that should not be revealed before hand. Please come out to be part of the event and see for yourself. Bring your own chairs and sun screen. Remember to dress for the weather. Monday, May 27 at 10:00 am. The following is the press release for the event: Sappington-Concord Historical Society Invites Public to Memorial Day Celebration Event features guest speaker Maj. Edward L. Hubbell, Assistant Officer in Charge of Medical Readiness for Scott Air Force Base St. Louis (May 17, 2013)— The Sappington-Concord Historical Society will host the biggest, little annual Memorial Day celebration in South County at 10 a.m. on Monday, May 27. The event takes place at Memorial Park, the small, grassy area that is bordered by Gravois, Denny and Sappington roads. Musicians from the Lindbergh High School Spirit of St. Louis Marching Band will kick off the celebration with several inspiring selections and will perform the Salute to the Armed Forces, recognizing veterans from each branch of service. This year, the Historical Society is proud to welcome guest speaker Maj. Edward L. Hubbell, USAF (Ret.). Maj. Hubbard is the Assistant Officer in Charge of Medical Readiness for Scott Air Force Base and has deployed several times to assist with evacuation of wounded and ill soldiers from the theater of war. His deployments since 1991 include Pearl Harbor, Honduras, England, Germany, Iraq, Kuwait, and Korea. In his civilian role, Maj. Hubbard serves as Director of Emergency Services for Mercy Hospital St. Louis The event also features a tribute to prisoners of war and soldiers missing in action by Master Sgt. Gary Cooper, USAF (Ret.) and Mr. Bob Pieper. CW5 Randy Ottinger (Ret. ), a veteran helicopter pilot who served in Iraq, will be Master of Ceremonies. The ceremony is open to the public, but guests are encouraged to bring their own lawn chairs for seating. Parking will be available on the lot of the former Johnny’s Market. Following the ceremony, all are invited to attend a reception in the auditorium at St. Lucas United Church of Christ, 11735 Denny Rd. There will be “Hometown Heroes” books for sale, and light refreshments will be served. 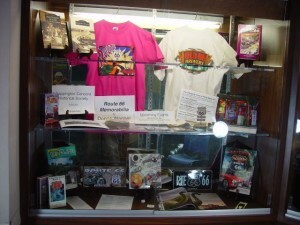 April Display Case at Tesson Ferry Library – Note, this event is over, held in 2013. Meet-at-the-Site tour to Anheuser House – Note, this event is over, held in 2013. April 24, 2013, 7:00 pm – Note, this event is over, held in 2013. Note: venue change Now in cafeteria at Lindbergh High School. Park in front of Commons. April will see the return of Marc Kollbaum to SCHS. We saw him in January when he guided us through the Powder Magazine Museum at Jefferson Barracks. Now at the Spring general meeting Marc will again bring his knowledge of military history to us, this time speaking on the cryptic topic of Civil War espionage. Marc Kollbaum, Curator and Jefferson Barracks Historian, will tell us about espionage techniques of the 1860s. Who made the best spies? What did spies do? What techniques were used to create codes? He will lead us in deciphering several encrypted messages. All are welcome, bring your friends, family and spies if you can find some! If this seems to be a replay of the January program, it is in a way. Due to circumstances beyond anyones control, Marc was not able to present at the January meeting, so he has graciously agreed to give his presentation to us in April. Also speaking briefly, Vietnam veteran Tom Ford, returns to tell us about the Vietnam traveling wall coming to St. Louis in June. Anne Arthur, Manager of the Tesson Ferry Library will also speak briefly about library services that we SCHS members can take advantage of. The Spring meeting will be on Wednesday January 23 at Lindbergh High School in the cafeteria (new venue) at 7:00 pm. 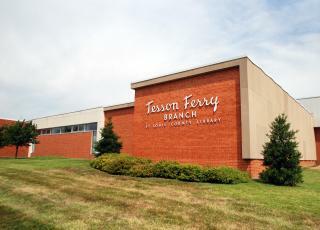 Arriving 15-30 minutes early recommended..
Daytime Presentation at Tesson Ferry Library – Note, this event is over, held in 2013. Meet-at-the-Site Tour to Jefferson Barracks Powder Magazine Museum – Note, this event is over, held in 2013. January means Jefferson Barracks. The winter general meeting will be on Wednesday January 23 at Lindbergh High School in the Anne Morrow Lindbergh Room at 7:00 pm. Marc Kollbaum, Curator and Jefferson Barracks Historian, will speak on Civil War Espionage. Learn about espionage techniques of the 1860s. Who made the best spies? What did spies do? How do you break a code? We will decipher several secret massages. On the following Wednesday, at 10:00 am, we will have our Meet-at-the-Site tour to the Jefferson Barracks Powder Magazine Museum. All are welcome, bring your friends, family and spies!